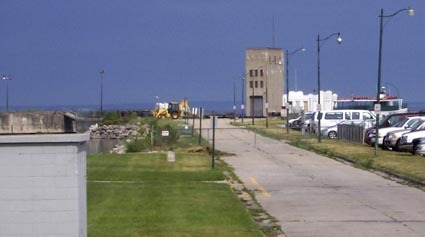 ​When the Bridge was opened to traffic in 1957, and the ferry ceased to be a part of the highway system, MDoT moved the endpoint of US 23 and 31 to the south landing of the Bridge (that was the case until about 1990, when US 23 and 31 were truncated to their current endpoints). US 27, on the other hand, was initially signed across the new bridge, ending at US 2 in St. Ignace. 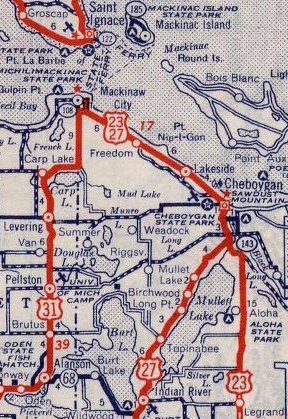 That lasted only until I-75 was signed across the Bridge a couple years later -- at that point US 27 was briefly cut back to Mackinaw, and then in 1962 it was truncated further, to Grayling (where US 127 ends today). last updated Dec. 5, 2016.